Momentus brings the hidden "Giant" monster into the game. Momentus has been known to consistently spawn Enraged Guardians for assistance when attacked by players. Unlike Marlix, Momentus takes less damage from a bow and more damage from a sword, making melee combat more desirable. Momentus can also deal an extreme amount of damage to a player. Momentus has the ability to draw in a player if they attempt to attack him with a bow, or even run away. This teleports the player to Momentus's feet, so that way, Momentus may easily attack the player. Momentus will only automatically attack you if you are on difficulty setting 7 or higher, as well as teleport to you if the Custom Mob Drop Risk Gauge is activated. There is a slim chance that Momentus will spawn in your vicinity when you are out in the wilderness. The spawn rate for Momentus is roughly once per 24 hours per player. Also note that there is likely only one active boss per world. He will despawn after roughly 9 hours. You can control the chance for Momentus to spawn by using your Player Settings (see the /ps command). This way, you can also prevent Momentus from spawning, which could be helpful if you're only out for building. 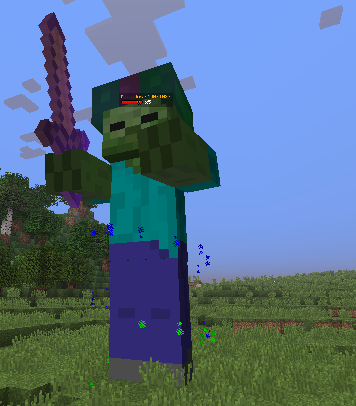 There's an array of EMC exclusive mobs in the Wastelands and Frontier. ocarinaDP, Todd_Vinton, Olaf_C and 14 others like this.